Open your account in 2 minutes. Choose how long to lend for. Choose what to do with repayments. 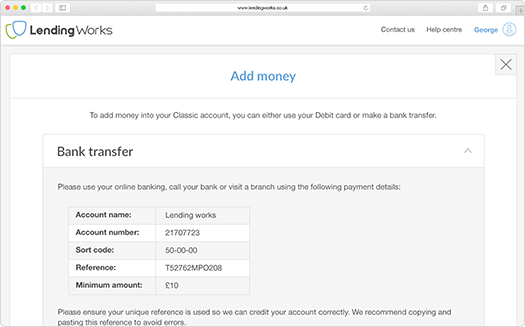 Add money by card or bank transfer. Register in just 2 minutes by completing our simple sign-up form. Your loans will last up to 3 years, earning 5.0% p.a. Your loans will last up to 5 years, earning 6.5% p.a. Want the best of both options? Split your money across the two rates. You're in control. 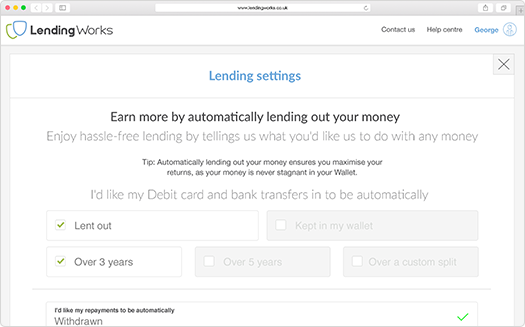 Set up your account to automatically re-lend your repayments, so your interest earns interest too! Alternatively, set up your account to automatically transfer your repayments straight into your bank account, either weekly or monthly. You can choose to withdraw interest only, or the full repayments. You can turn off all automatic settings and manage your account manually. The choice is yours. 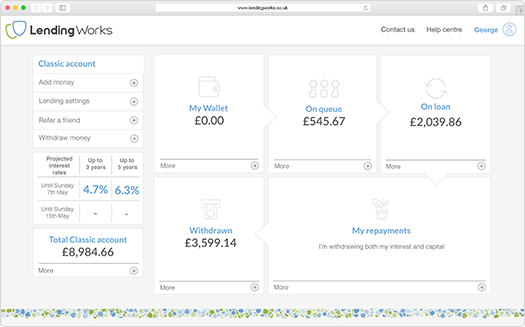 Start lending from as little as £100 – simply add money by debit card or bank transfer. It's quick and secure. What happens next? Your offers will be placed in the queue to be matched with creditworthy borrowers. 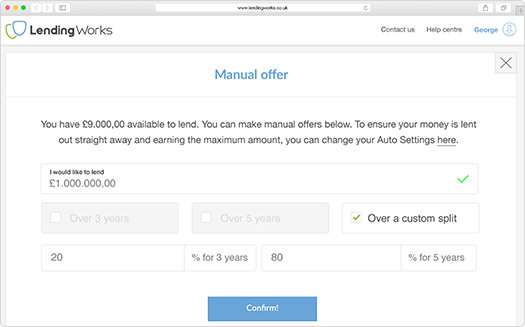 You'll be able to manage your offers and see exactly how long we anticipate it will take to match your money. As soon as you're matched, watch your money grow! Remember, returns aren't guaranteed and your capital is at risk. Need to get hold of your money quickly? For a small fee of 0.6%, you can take some – or all – of your money back early, provided we can find another lender to step in and take over your loans.